Hey, Lady Grey: Food Inc. 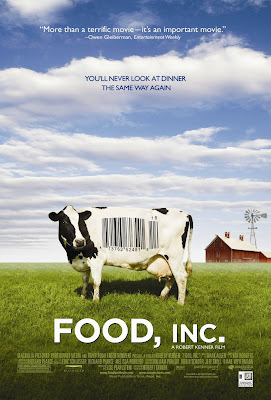 So I finally watched Food Inc. the other night, and I highly recommend it. The film was so well done and most importantly not overdone. When I was 17 I read Diet for a New America, by John Robbins. While I still think this is a great book, its detailed description of slaughterhouses was so horrifying and traumatic that I was guilted into becoming vegan for a year (and that wasn't a particularly good year for me). What I liked about Food Inc was how they showed you the brutal reality of our food system without relying on guilt or shock value to persuade you. The vibe of the film was hopeful - there is a better way of farming out there (even for meat), we as consumers just need to demand it. If by chance you haven't seen the film, rent it. Everyone should see this film. We all need to know more about where our food is coming from.